The history of Amityville is interesting in itself. It had many famous people living there besides Ron DeFeo and George Lutz. This included Annie Oakley, Will Rogers and Al Capone. Buffalo Bill Cody was even a regular visitor since his Wild West Show was headquartered nearby. 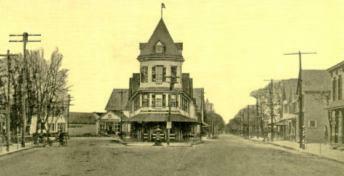 The Ketcham family at one time owned much of the land in Amityville. According to Attorney William Weber the land that the famous Amityville house is on wsa at one time owned by John Ketcham. He learned about this at the Huntington Historical Society because at the time of John Ketcham Amityville was in the Town of Huntington. "Buffalo Bill... often visited the homes of Fred Stone, a popular vaudevillian, on Clocks Boulevard and comedian and satirist Will Rogers, who rented across the street. There was also the infamous gangster Al Al Capone, whose tenure in Amityville was marked by nothing more sensational than an occasional vacation baseball game on his lawn." "How It Got Its Name: Tired of the cumbersome name of Huntington West Neck South, residents met in 1846 to decide on a name for the post office. According to one version, the meeting soon turned into bedlam, causing one participant to exclaim, `What this meeting needs is some amity.'" The picture left was taken in Amityville in 1916. Amityville was the site of the first flying guided aircraft which was called the Sperry Aerial Torpedo tests. It is the forerunner of cruise missiles and was built by Lawrence Sperry. Famous residents of Amityville included Will Rogers and Annie Oakley. She lived there because the headquarters of Buffalo Bill's Wild West Show was nearby. They both lived on the same side of Ocean Ave. as the famous horror house. John Ketchum. Annie Oakly and the Amityville horror newspaper. Long Island's Amityville History. Legends & Horror House in amityvill. Amitiville Horror House and the history around it.